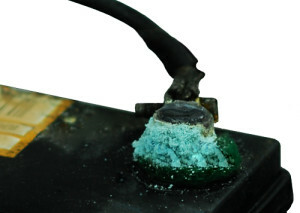 Battery terminals have a tendency to get corroded from time to time. Corroded battery terminals increase the resistance level, which results in a drop in voltage. This can cause various performance issues. A number of people think that this is caused due to faulty battery. They replace the battery when the only thing that needs to be done is to clean the battery terminal. Chemical reactions between the sulfuric acid and the metal of the battery terminal lead to the buildup of corrosion on the battery. Battery corrosion is typically more prevalent on the positive battery post, but it can occur on both the positive and negative terminal. How to Clean Battery Corrosion? It is important to clean the battery terminals regularly to remove the ‘gunk’ that forms at the terminals. There are a number of ways to clean the battery terminals. In order to clean the battery terminals you will need the following items. After you have gathered the above materials, you should first put on the safety goggles and rubber gloves. This will protect your eyes and skin from sulfuric acid that is present in the corrosion deposits. Next, use pliers, a wrench and a small battery cable puller to disconnect the battery cables from the terminal of the battery. You must disconnect the negative terminal first followed by the positive terminal. Now, scrape off any greenish or white corrosion deposits with the stiff bristled brush or a scrapper. Next, mix one tablespoon of baking soda with a pint of water. Carefully apply this mixture to the outside of the battery and the cable connections with a small funnel. Use the brush to work the baking soda solution into the heavily corroded areas of the battery. Finally wash the battery and terminal with a sponge dipped into clean water and then dry off the battery with a dry rag or cloth. After cleaning the battery you should reinstall the battery cables to the terminals. When reinstalling the battery cable, remember to connect the battery cable to the positive terminal first. Apart from the above method to clean the battery terminal, you should know that a can of soda can also clean corrosion from the batteries. Although it won’t properly clean the battery terminal, it is effective in situations when you are stranded outside and the car won’t budge due to corrosion of the battery terminal. The cola in the soda will eat away the salts in the battery terminal thus allowing the battery to provide proper power to start the car. You might also like: What is sulfation and how to prevent it?